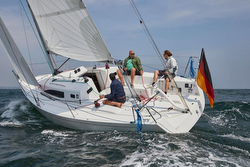 (Seattle, WA)- In the past month or so, readers in both Germany and the USA’s Pacific Northwest have had a chance to learn more about the dynamic, easy-to-sail J/97E sport cruiser. 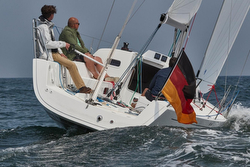 In Germany, the YACHT magazine took the opportunity to compare/ contrast four current performance-cruisers of the ten-meter class: the J/97E, the Dehler 34, the Diva 34 and the Elan S4. Their hope was to find out if they were cozy or sporty or even better- both. The four boats were sailed out of Neustadt, Germany and testing took place on the Baltic Sea. In the first part of the test, the YACHT test crew was mainly concerned with the sailing characteristics of the yachts. In addition to evaluating their performance, it was also about the layouts on deck with all the advantages and disadvantages of handling in a maneuver. There are comparative comments on the equipment on deck and on the quality of the attachments. And the YACHT testers also dealt with the maneuverability under power in the harbor. In Seattle, WA in the Pacific Northwest, there is also a lot of racing on Puget Sound as well as cruising in the gorgeous San Juan Islands. Joe Cline, Editor of 48° North, took a new J/97E through its paces and here is his commentary below. “The J/97, in some form, has actually been on the market since the first hull was finished in 2008. It was built to prioritize ease and versatility while maximizing performance under the IRC racing rule. It did so beautifully, with many early wins, and a great deal of positive response from cruising and racing sailors alike, as well as critics (it won Sailing World’s Boat of the Year for Best Club Racer in 2010). Since that time, the boat has gotten a primarily cosmetic design update and is now called the J/97E, but the broad appeal remains. 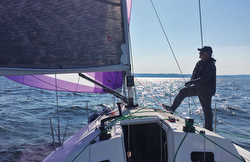 New boats have been selling in the Pacific Northwest, including the one that belongs to Scott McConnell, who is a terrific guy and who took some of the 48° North crew sailing recently on a stunning September day. Sailing with new boat owners has become a real joy for me; it is so fun to get to know why someone makes the big decision to buy a new boat. 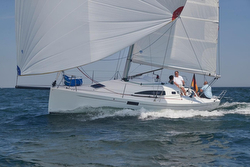 In Scott’s case, he’s started in a San Juan 24 before moving into larger cruising boats. Now he’s excited to downsize, and says that having a boat he really wanted to go sailing on – something fast, fun, and easy – was his biggest motivator to choose J/97E. Unlike his other boats, he’s keeping the boat nearer to his home instead of closer to the islands, and he’s LOVING it, sailing more often than he even hoped. I had a chance to explore the J/97E at the Seattle Boat Show and was truly eager to see her in action. Honestly, of all the boats I’ve tested, the J/97E might be the boat that best suits my personal sailing desires, with its simplicity, speed, and ability to race or cruise, all in a midsize package. I’ll try to keep any personal bias in check. The J/97E is a very sharp design, and approaching the boat from the dock, she really looks quick. I didn’t notice it from the dock view, but once I stepped on deck, I felt the beam. An 11’ beam is not enormous, but it’s quite a lot for a 31’ boat, regardless of its intended use. It’s also somewhat reminiscent of certain J/Boats of old (11’ is the beam measurement of the J/29, and the J/30 is 11.18’). The last sail test I did on a J/Boat was on the J/88, a boat with a clearly different design purpose and a beam of 9.5’. Nonetheless, I found the J/97E notably beamier that the J/88 on deck, in the cabin, and under sail. The beam on the J/97E is likely a result of the desire to maximize both interior space and rating under the IRC rule. The interior has an efficient and comfortable layout for cruising, which I’ll discuss a bit more later. In addition to the beam, the IRC maximization also can be found in the way the knuckle at the plumb bow sits out of the water, shortening the waterline measurement, but leaving it functionally long when you’re underway. In addition to the beam and the bow design, the boat is also fairly heavy for its length, another design element likely aimed at IRC. I toured the whole deck layout, and it is really beautiful in it simplicity. Moving around the boat was easy from stem to stern with ample side-deck and room to get under the outboard-set shrouds. I am a huge fan of the J/97E’s cockpit layout, with bench seating forward of the traveler and the more wide-open design aft with dual foot pushes. Since this is a tiller driven boat, the cockpit felt particularly spacious without a wheel pedestal. Different than the original J/97, the J/97E has the traveler on the cockpit floor, which makes movement fore and aft seamless. And with the beam, that bar is LONG! I asked Scott whether they ever use its full length, and he said they tend to keep the car in the middle 75% of the bar, but it’s nice to have options. I agree! I noted the cleverly rigged in-haulers for the jib. Since the boat has a one-design sail plan with a non-overlapping 105% jib, those in-haulers will be an important device for getting the most out of the boat in lighter breeze. The in-haulers are permanently rigged, and Scott mentioned using them a lot, even while cruising and day sailing. A lot of production boats have moved to non-overlapping sails in a way that leaves many of them wanting power with the stock sail plan, the J/97E will not suffer in the same way. We headed out sailing with a 12-14 knot northerly… we really couldn’t have asked for better. The size of the boat makes the sail setting easy – nothing is too loaded. In the conditions we had, we were quickly into de-powering mode, putting something extra on the halyards, moving cars aft, and pulling on backstay to reduce headstay sag. I found myself wondering about rig tension for the fractional, swept-two-spreader mast – should we have had more, and is this a boat on which owners will want to adjust their shroud tension as the conditions change? As we set off upwind, I was immediately aware that I could feel when the boat was lit-up and moving, and when it was choked or needed to be powered back up. I love that kind of feel. That said, I found it a somewhat challenging balance, because pushing the boat to feel powered up and fast led us to sail with more heel than was probably efficient. It’s the kind of thing that owners of these boats probably dial in quickly, but it wasn’t super intuitive for me. I loved playing with the jib set-up. It is so adjustable, and the controls allow for beautiful shape. We didn’t need much in-hauler in the breeze we had, but I’d estimate that you could get at least six inches of play inboard/outboard, which is a lot. Sailing upwind, I felt the beam again. Compared to the narrower J/Boats designs that I have more experience with (J/105, J/80), I felt like the groove going to weather, at least in our conditions that day, was a bit narrow. It can be attributed most to sailing too heeled, but we actually overpowered the rudder several times going upwind. In spite of those moments, the boat felt maneuverable, and the tiller was never unwieldy. Even if the groove was a little narrow for our set-up, when you were dialed, it was fingertip-control on the tiller. One of the great things about the hull shape is how good it felt going through the waves. It’s motion was smooth, likely a product of her 8,600 pound displacement. And its way through the water seemed particularly buoyant – the bow stayed high and the deck stayed dry. This is a boat that already has an impressive offshore resume, and this sense of buoyancy would be confidence inspiring in swell. The J/97E is definitely fast. The boat’s instruments were yet to be calibrated, but our handheld GPS showed us beating well above six knots. After an hour or so of exciting, blissful upwind sailing, we rigged the monstrous asymmetrical that sets off the six-foot telescoping bowsprit made of carbon fiber. We set methodically, trying not to light the boat up until we were ready. Once the kite was up and sorted, then… “everybody ready?” We turned up a few degrees and we were off. The boat felt incredible under spinnaker. On this point of sail, I was in love with the beam. It felt fast and stable. The GPS climbed above seven knots, above eight – easy, under control, and fun! We trimmed by hand except when we really heated up to a reach. Scott and his wife sail the spinnaker double handed, and I can see how that would be no problem. I was impressed by the minimal stern wave we were creating– our way through the water was smooth. This is important, because the J/97E is not a boat likely to plane. Surf? Sure. But, if a boat is going to displace 8,600 lbs of water, to do so efficiently is a true success. While you’re not likely to spend time on a plane, the boat is certainly still performance-oriented. And remember, this is a cruising boat too! Speaking of cruising, that interior is perfect for a couple or a family. The beam is a big benefit to the cabin, and it’s really an elegant use of the space. 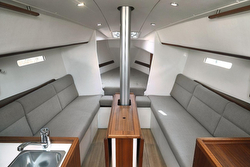 There is 6’ headroom and accommodations for a comfortable cruise. It sleeps six, but that would be cozy. There’s a private double berth aft, and a spacious v-berth that is open to the main salon. The galley is small, but has all the basics: stove, oven, refrigerator, storage. There’s a nice, double-sided seating area in the salon. It has an enclosed head with shower to starboard, opposite the aft cabin. In my own words, the J97E boat is pretty awesome. It’s a very attractive boat that is genuinely versatile. It feels powerful, is really fun to sail, and its accommodations are really impressive for a boat of this size and performance pedigree. I couldn’t help thinking that with all of its fun and functionality to go along with the simple sail plan, a crew of four, five, or even six could do something like Van Isle 360 unsupported on this boat and absolutely have the time of their lives. In short…I want one! !” The 48 North J/97E boat test story For more J/97E sport cruiser sailboat information Add to Flipboard Magazine.